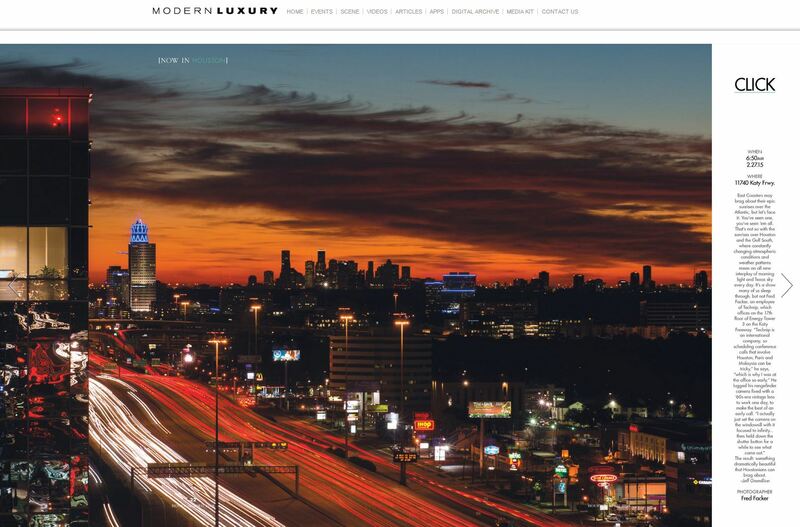 Well, Gimme Shelter isn’t actually in the magazine, but I’m flattered that one of my long-exposure photos is featured in the CLICK section of the April issue of Modern Luxury Houston. Even if you’re not a Houstonian, you can still check it out on pages 22 and 23 of the digital edition. Thursday, April 9, I’ll also be on 88.7 FM KUHF Houston Public Radio from 5-6 p.m. representing Technip and matching donations during the Spring Fund Drive as part of our commitment to transparent reporting, sustainable development and community outreach. And while I’m just promoting random stuff, I thought I’d mention that the crew of Gimme Shelter provides freelance copywriting, design, photo, video and translation services to fund our adventures. If you’re in need of any of those things, visit our photo site at www.fredfacker.com and like our Facebook business page Facker Media Services. Congratulations on the note of recognition–a spectacular photo, indeed! And I’m totally on board in support of the topics you’re an advocate for. The station is lucky to have your support.